Christmas tree decorations - Global traditions and different ways to decorate a Christmas tree. Hints and Things does not use any 1st Party cookies - more information. I’m often uninspired by the sight of people’s Christmas trees. When most, if not all, of the decorations are the same colour and shape, and they’ve opted for one set of plain lights, the overall effect can be somewhat disappointing. A Christmas tree should be a beautiful, festive focal point of a room; while it should of course suit your own tastes and style, what I disagree with are Christmas trees which lack any sort of personality or originality. I love to learn about the traditions and customs which other countries adopt at Christmas and this has inspired me to come up with some great ideas for making a Christmas tree which is representative of Christmas traditions around the world. Before you even begin to think about decorating, you’ll need a fantastic tree to work with. I would always opt for an artificial tree over the real deal. They can be used time and time again, so they’re cost effective and much better for the environment. The top of your tree should be around half a foot from the ceiling of the room, so it’s important that you know the height of your ceiling. If you buy a Christmas tree from Hayes Garden World, you can organise your search by height, which is the easiest way of making sure you get the right size. The custom of decorating a tree for Christmas first originated in Germany, so it’s only right that every tree displays something of this origin. 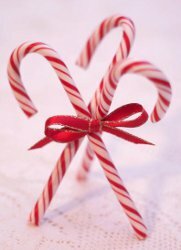 Traditionally, villagers would hang sugared sweets for children on the branches of the trees; this is a wonderful idea that will make the tree more than just decoration and have children flocking around it throughout the festive season – providing you replace the sweets regularly! Opt for something rolled in sugar that will sparkle beautifully in the light of the tree. Swedish households decorate their trees with snowflakes and stars made from straw, in simple designs. Making your own decorations is a great activity to do with children and is the perfect opportunity to teach them about the different customs of countries around the world. Other popular decorations in Sweden include wooden animals, to represent those in the stable at the birth of Jesus. A small population of the Chinese population celebrate Christmas and decorate their trees with paper lanterns in traditional Chinese designs. Though it’s not safe or practical to light these lanterns using a candle, positioning the lights on your tree so that they shine through the lantern will create a wonderful effect. In the Ukraine, it’s traditional for trees to include some form of spider’s web, whether it be a small ornament or a large web covering the entire tree. The tradition can be traced to Ukrainian folklore and a tale about a poor woman who couldn’t afford to decorate her tree. One morning, when the woman woke up, a spider had covered it in a beautiful, glistening web. The story of the spider’s web is the reason why so many households decorate their trees with tinsel, a trend which was adopted by other nations. 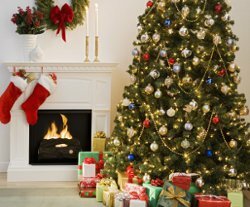 All of these ideas will help you to create a unique and beautiful feature of your room, as you acknowledge and embrace Christmas traditions from around the world.